In one of the foremost critiques of the widespread view that in market-based economics the fluctuations of the marketplace are essentially self-regulating, Eli Ginzberg argues the reverse. He asserts that government regulation or intervention to provide stability in the capitalist marketplace is a necessity. In this classic statement of macroeconomic theory, Ginzberg argues that self-directed stable economies, devoid of an appreciation of social and psychological factors, are essentially illusory. The ability of strong blocs--corporate, labor, and agricultural--to control the market in the hope of bettering their economic position places great difficulties in the path of securing a stable economy. For Ginzberg, economic fluctuations in the decade preceding the Great Depression can largely be explained by the interaction of technological, psychological, and monetary factors. 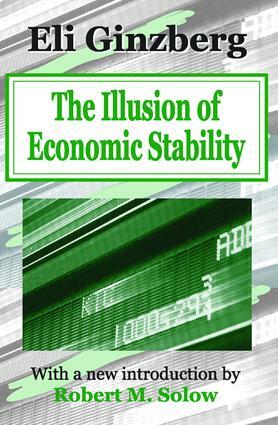 Without these factors being subjected to some sort of control, economic stability must remain an illusion. The current period of a significant fall-off in earnings, profits, and full employment also followed a decade of unparalleled monetary growth. The concerns Ginzberg raised are relevant once again. It may turn out that the "neoliberalism" of the present has something to say in response to the free market/free society premises currently in vogue. In a brilliant introductory essay, Nobel Laureate Robert M. Solow offers an impressive report card on The Illusion of Economic Stability: "The prose is tighter and more aphoristic than late Ginzberg, and the tone is more detached, even sardonic." He concludes by admitting that a volatile stock market is one more reason why automatic economic stability seems as illusory today as it did when the book first appeared.